At least three people were arrested this morning during the massive deployment and forced entrance of gendarmes into several locales at the ZAD, again and further increasing tension. In parallel, the Prefect – this is not her first contradictory act or statement – had announced a halt to the military/police eviction operations in the ZAD after a week of destruction of homes and agricultural spaces. The inter-group assemblies that bring together ZAD residents and the various components of the movement will reflect and determine the appropriate responses to the current orders being issued by the Prefecture at the appropriate time. But what is certain at this moment is that we consider the brutal show of force this morning intolerable, as well as the manifest desire to take revenge on those who have defended the living spaces in the ZAD by making arrests. What we are sure of is that it will not be possible to reflect serenely on what is to happen next so long as the ZAD is targeted by this type of police action. And what we firmly believe, after the formidable wave of solidarity that rose this week, is that despite the destructions, the ZAD will find ways to continue to live and to resist. We maintain our call for our supporters to join us massively here on the ground at noon on Sunday. 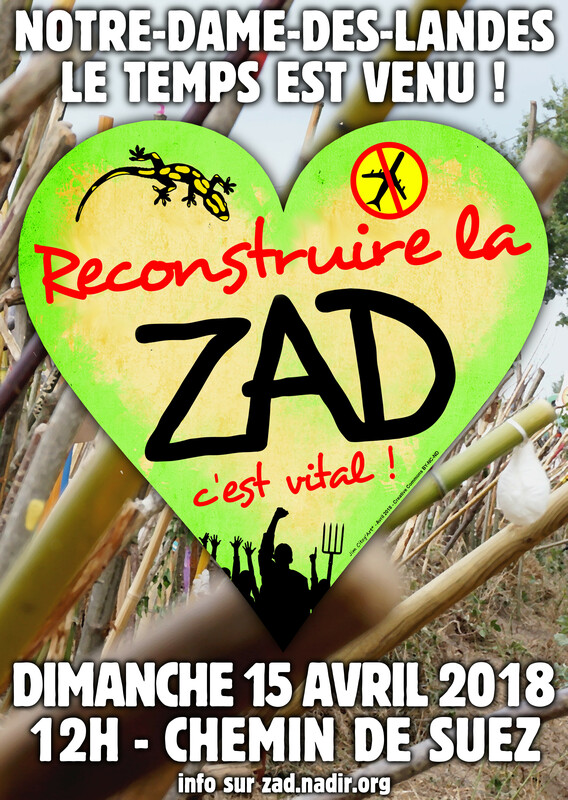 We also remind you of the demonstration against the expulsions and for the future of the ZAD tomorrow in Nantes at 4:30 p.m. beginning at the Place du Cirque. Nantes: [Tram: Orvault Grand Val]: hitchhike on the roundabout after the end of the tram line towards Orvault Bourg, then towards La Paquelais. Demosphere, the open calendar – https://demosphere.eu – have a car-pooling tab for each of the events. So if a call for mobilisation is posted there, like the one for Nantes – https://44.demosphere.eu/rv/2659 –, you can sign up there (“Covoiturage”). And if not you can always propose one as a national appeal by adding a line explaining that you want to organise transportation locally. Blablacar (much less open) also has car-poolings for this weekend. However we must warn you that people are having fun by creating several fake accounts on Blablacar and listing fake car-poolings to the ZAD: only trust the accounts where there are several long-standing comments! In fact we sincerely would prefer it if all the transport strikers would strike by providing free transportation to Notre-Dame-des-Landes, which would be awesome! We’ll take advantage of the opportunity to tell you that with your generosity and support you are now proving that you can struggle EVERYWHERE for EVERYBODY! What you are doing for us, you can also do to help young people fight the privatisation of the education, help people in precarious situations find and keep a home, an income, or simply the dignity of not possessing wealth – which can be a choice –, help workers to keep from being individualized enslaved under the yoke of false competition, help keep health a shared and common good, and also energy, help here and beyond our borders, both physical and psychic. Against the world of Macron and money, Sunday, let’s make the ZAD the tomb of capitalism, and starting Monday, lets transpose our struggle everywhere!!! Reminder: We combat, daily, and try to deconstruct sexist, virilist, homophobic, racist, classist, validist, able-ist, etc. behaviours; we will not accept them among us, even under the pretext of confrontation. And don’t forget: We are the “good guys” and we will win in the end!